Parenting the girls this afternoon was a bit of roller coaster. We’d had a busy weekend traveling and visiting family, and we arrived home a little after midnight last night. The girls powered through the school day, but things got a bit delicate after that. But they were awfully cute, too. Shortly after both girls arrived home, they were on the sofa happily chattering about their mutual iPod obsession, Hay Day. They’d tangled their legs up on top of each other and murmured about their recent virtual agricultural triumphs and challenges. I couldn’t restrain myself: I approached with the camera. Big mistake. M scrambled up onto her feet. “What? What are you taking a picture for?” J demanded. “You guys were just being all cute,” I replied weakly. “We’re just here! What’s cute about that?” They were both annoyed. And, that’s right: I killed the moment. Anyway, it was ugly. Except that I was cheerful, because I’d managed to keep my cool and go into my Mommy Zone. I was busy in the kitchen when I realized that J had spearheaded a craft project and managed to get M involved as well. Turns out she’d decided to create a holiday zone for her room. So cute! 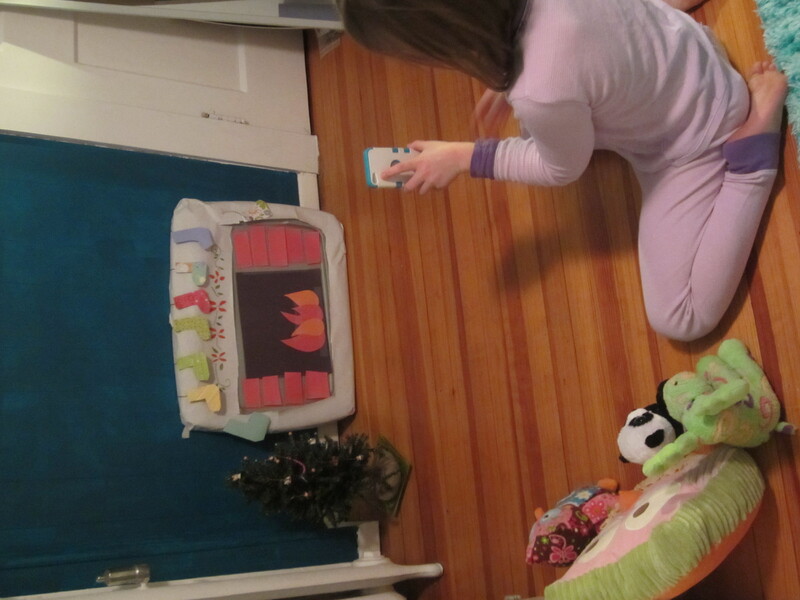 If you click to look at it up close, you’ll see that she even copied the stencils that are on our fireplace. The stockings are for the assembled stuffed animals. Which, hello, does this mean that Santa needs to give them each a treat? J already left some broad hints that she really hoped that Holly the Elf would return this year. She’d picked up this vague notion that elves arrive on December 1st. So last night, after unloading the girls from the car after midnight, I managed to scrounge up Holly, who obliged us by perching on the chandelier and offering up some chocolate-covered pretzels that I’d impulse-bought on our trip. Incidentally, J arrived home from school this afternoon reporting that her friend’s elf had stolen the child’s iPod and had it stuck to the elf (which you’re not allowed to touch), thus imposing a screen-free period. That, my friends, is a brilliant mother. Which reminds me, I think that elf needs to get moved before I get. 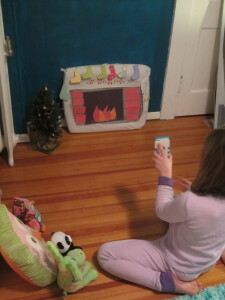 I think she’s dying to warm herself by a construction paper-and-tape fire. That fireplace craft is adorable! @Claire, I know, right? Which I can say, because I didn’t have anything to do with it. Best was that they were helping each other–that always makes me so happy!